The first of the new features is the ability to edit the advanced settings of HA clusters. There are four new cmdlets that allow you to customize HA settings – Get-AdvancedSetting, New-AdvancedSetting, Set-AdvancedSetting, and Remove-AdvancedSetting. Update the value of an existing advanced setting for all clusters. Updating can be done also through the New-AdvancedSetting cmdlet and by using the –Force switch. This row adds a value or overrides the already assigned value. Remove a specific customized setting for all clusters. You can refer to the vSphere Availability Guide for the full list of HA advanced settings. The third new feature is the addition of new properties in Cluster objects. These properties describe HA cluster runtime information and their names are HATotalSlots, HAUsedSlots, HAAvailableSlots, HASlotCpuMhz, HASlotMemoryMb and HASlotNumVCpus. For example, let’s see how we can create a report that shows the count of total slots and the count of currently used and available slots. This entry was posted in Uncategorized on December 16, 2010 by Vitali Baruh. The new PowerCLI 4.1.1 has improved compatibility with scripts written for PowerCLI 4.0.1 and earlier. PowerCLI 4.1 moved cmdlet output types to new namespaces. This introduced incompatibility with scripts which depend on output types’ full namespace path. To negate the impact of the change and to enable a transition period in which scripts can use full references to both old and new namespaces, PowerCLI 4.1.1 includes additional set of types which reside in the old namespaces (“the old types”) and are implemented by types in the new namespaces. IMPORTANT: The described compatibility support is temporary. We plan to remove the old types in the release following 4.1.1. This means that no new scripts should be written based on the old types and legacy scripts should be updated to remove dependencies on the old types. As always, it is advisable to avoid full namespace references where possible, and to reference types in the *.Types assemblies instead of their *.Impl counterparts. This entry was posted in Uncategorized on December 10, 2010 by Andrey Anastasov. Returns both standard and distributed switches. You can filter the retrieved switches by their type. Returns the virtual port groups of the specified standard and distributed switches. You can retrieve the hosts that are connected to a specific distributed switch. You can retrieve the virtual machines that are connected to a specific distributed switch. You can retrieve the host network adapters that are connected to a specific distributed switch. You can attach network adapters to a specific Port Id of the distributed switch. By using PowerCLI cmdlets, you can migrate virtual machines and hosts between distributed virtual switches, and also create various reports related to distributed switches. 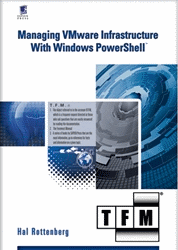 This entry was posted in Uncategorized and tagged Distributed switch, Get-VirtualPortGroup, Get-VirtualSwitch, PowerCLI 4.1.1 on December 7, 2010 by Yasen Kalchev. More details on host firmware functionality are available in the product help or PowerCLI online help. This entry was posted in Uncategorized on December 3, 2010 by Gospodin Gochkov. Retrieves the SCSI controllers of the specified virtual machine. Creates VirtualBusLogic SCSI controller with no sharing support and attaches the specified virtual hard disk to it. Updates an existing SCSI controller’s type and sharing mode. Besides, you can create a new hard disk by specifying an existing SCSI controller and change the SCSI controller of an existing hard disk. New-HardDisk and Set-HardDisk cmdlets are enhanced with a new “Controller” parameter that accepts objects returned by New\Set\Get-ScsiController cmdlets. Note that you won’t find a Remove- ScsiController cmdlet. The reason is that you cannot remove a SCSI controller used by at least one virtual hard disk. If a SCSI controller becomes unused by any hard disk, it is automatically removed. For more details about the support for virtual machine SCSI controllers, check out the PowerCLI cmdlet reference and the online documentation. This entry was posted in Uncategorized on December 2, 2010 by Irina Nikolova. Note that you have to be connected directly to your ESX, in order to retrieve EsxCli instance (It won’t work with VMHost instances, retrieved from a VC). Note that this feature is experimental. This means that in future releases backward compatibility is not guarantied. This entry was posted in Uncategorized on December 2, 2010 by Pavel Dimitrov. Greetings to all vSphere administrators out there! We are now going to take a look at a new functionality introduced in PowerCLI 4.1 Update 1 – namely vSphere alarms management. We assume that you are already familiar with the vSphere alarms functionality. For those of you who are not, here are some resources on the topic: vSphere Datacenter Administration Guide (see Chapter 13 “Working with Alarms”). Here’s an excerpt from the VMware documentation – “Alarms are notifications that occur in response to selected events, conditions, and states that occur with objects in the inventory. … The vCenter Server system is configured with a set of predefined alarms that monitor clusters, hosts, datacenters, datastores, networks, and virtual machines.” The current PowerCLI 4.1 Update 1 release supports only modifying the predefined alarms that come with the installation of vCenter Server. With the new cmdlets, you can modify: the alarm actions, the interval on which alarm actions repeat (if repeatable), the alarm names, the alarm descriptions, and whether the alarm is enabled or not. We’ll look at some examples of how we can use these alarm management cmdlets. Get-AlarmDefinition is a typical PowerCLI getter. It returns all the alarms defined on the vCenter Servers you’re connected to. There are also some optional parameters which allow you to filter the results by name, by the inventory object on which the alarm is defined, and by its state (enabled or disabled). Get-VMHost hostname | Get-AlarmDefinition # This will return all alarms that apply to the host “hostname”. This includes alarms defined on this host and alarms inherited from the parent entity, or from any ancestors in the inventory hierarchy. $alarmDefinition = Get-AlarmDefinition "Host storage status"
This entry was posted in Uncategorized on December 2, 2010 by Nedko Nedev. PowerCLI 4.1.1 introduces the new Get-EsxTop cmdlet. This cmdlet provides functionality similar to the “esxtop” utility. The cmdlet allows you to access a wide variety of stats for your virtual environment – thus allowing you to create even more versatile reports using PowerCLI. You can use these three sources to navigate the esxtop information and build your reports. Get-EsxTop works on ESX 4.0 or newer. The cmdlet is dynamic in its nature, meaning that the returned values may differ between ESX versions and the actual data returned is appended as PowerShell dynamic properties to the output objects. Please note that the cmdlet is currently experimental and its output may change in future PowerCLI versions. This entry was posted in Uncategorized on December 2, 2010 by Dimitar Hristov. Tonight we released PowerCLI 4.1.1. The complete change log is available here. In the next few weeks we’ll present the most exciting new features with specific posts so stay tuned. In the meantime don’t forget to download and try the new release. This entry was posted in Uncategorized on December 2, 2010 by Andrey Anastasov.